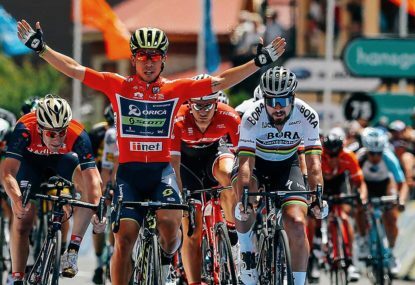 Tonight Cycling Australia will announce its nine-man Tour de France ‘Team of the Century’ at its annual awards night in Melbourne. The answer is quite simple: the one that has just passed – starting in 1914 and ending in 2014. Although the world’s most famous cycling race made its debut in 1903, Australia’s rich history with the Tour did not start until 11 years later when pedalling pioneers Duncan ‘Don’ Kirkham and Iddo ‘Snowy’ Munro became the first Australians to race the Tour in 1914. Since then another 49 Australians have crossed the globe to ride through the French countryside in July – most recently with 2014 debutants Luke Durbridge, Mathew Hayman and Zak Zempster. Picking a team out of a list of 51 riders – many of whose careers did not coincide with the era of live TV coverage – is both a challenge and a doddle. It is the latter because, come one, some riders really pick themselves (stand up, Sir Cuddles) and the former because, well, it would be just too easy to select from the pool of current riders that we are all so familiar with. History deserves some respect – which is precisely why, for example, you’ll see that I have not chosen Richie Porte for my team (but more on that bombshell later). There are certain criteria to be respected: the six judges cannot select any riders who have served doping suspensions or made a doping confession; this means there’s no place for the likes of Stuart O’Grady (two stage wins and two stints in yellow from a record-tying 17 participations between 1997 and 2013), Neil Stephens (one win from six Tours, 1992-98) or Matt White (whose 23rd place in his only Tour in 2005 would probably not have merited him inclusion in the first place). There is also a Fantasy Cycling-style rubric in that the final nine-rider team must be made up of two general classification riders, two domestiques, one sprinter, two lead-out riders, one all-rounder and one team captain. I may be a Pom and therefore bat for the other side (so to speak) but for what it’s worth here’s my nine-man Australian Tour Team of the Century. 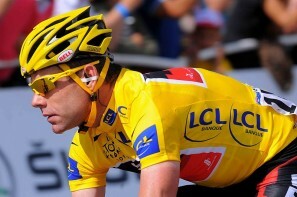 The first name on anyone’s list should be Cadel Evans, Australia’s first and only winner of the Tour de France. Eighth in his debut Tour in 2005, Evans twice finished second before eventually standing atop the podium in Paris in 2011. 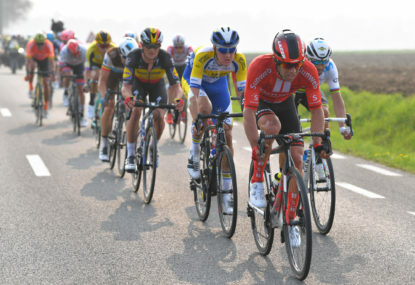 Now 37 and on the verge of retirement, Evans has been remarkably consistent in the Tour – and picked up his two individual stage wins during an era when many of his big rivals were benefitting from the kind of boost that would render them ineligible for similar dream teams should their respective nations decide to follow suit. Plan B for the GC, should Cadel have one of the kind of days in the mountains that blighted his last two attempts at riding the Tour, is none other than The Roar‘s own Phil Anderson – the first Australian (and non-European, for that matter) to wear the fabled maillot jaune back in 1981. Top-ten finishes in his first five Tours shows that at his peak Anderson would have been more than capable of co-leading a hypothetical team alongside Evans. Anderson’s tenth place in his debut Tour was the best result by an Australian since Hubert ‘Oppy’ Opperman finished 12th in 1931, one year after he finished 18th in his debut. Oppy was joined in the 1931 Tour by Richard ‘Fatty’ Lamb, whose wonderful nickname is entirely apt for a chap who became Australia’s only ever Lanterne Rouge to date. Despite their achievements, neither Opperman nor Lamb make my cut, however; not even as a domestiques. My first domestique berth is taken by Mick Rogers – a controversial decision given his positive for clenbuterol in 2013. 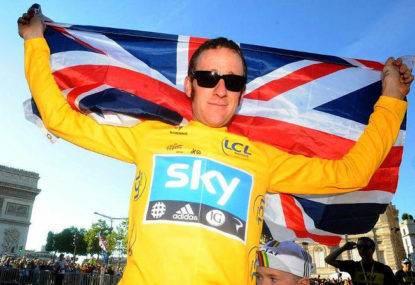 But seeing that he was subsequently cleared by the UCI of any wrong-doing, it would be folly to overlook such a dynamic and strong rider as Rogers, a veteran of ten Tours, a top-ten finisher in 2009, a key lieutenant to Bradley Wiggins in 2012, and a stage winner himself last July. Riding alongside Rogers in the engine room of my team will be Don Kirkham, one of Australia’s two Tour trailblaizers. Considering the culture shock and their relative lack of experience, debutants Kirkham and Snowy Munro performed quite admirably in 1914 to finish 17th and 20th respectively in the 12th edition of the Tour 100 years ago. If the decision to choose Kirkman over a contemporary star such as Richie Porte – or another strong rouleur of yesteryear such as John Beasley (two participations in the 1950s) – may seem a bit arbitrary, it’s because it is. That said, Porte – as key as he was during Chris Froome’s overall victory in 2013 – is yet to really show his true potential in his four Tours to date, his highest finish being 19th in the year his Sky teammate triumphed in Paris. On to the sprinters – and quite an easy choice, really. With 12 wins in 12 participations, Robbie McEwen is Australia’s most successful sprinter of all time – and at the peak of his career he was arguably the world’s fastest man on two wheels. Three times a winner of the Tour’s green jersey, McEwen was a tenacious battler and powerful accelerator who did not rely on a lead-out train to take his wins. This makes the prospect of him being chaperoned by Bradley McGee and Baden Cooke as all the more mouth-watering. Should McEwen come up short, then Cooke would be on hand to take over sprinting duties – after all, he famously rounded Robbie on the Champs Elysees to take second place and deny his countryman another green jersey in 2003, having claimed his only Tour stage win earlier in the race. McGee frequently led out his CSC and Saxo Bank teammate Stuart O’Grady during his career and managed to notch two Tour stage wins himself – including victory in the 2003 prologue. Fast and fearless, bulldogs Cooke and McGee would form a brilliant mushing duo for McEwen. So, we’re down to just two more spots on the squad – and there’s still a lot of talent left on the sidelines. I’m afraid there’s no spot for marathon man Adam Hansen, despite his astonishing record of 10 consecutive Grand Tours. A stage victor in both the Giro and Vuelta, Hansen is yet to secure a win on the Tour and (for many, criminally) is overlooked for selection. 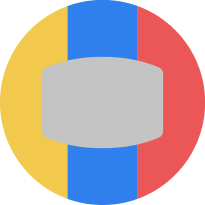 Mark Renshaw and Matt Goss could clearly have performed admirable lead-out duties for McEwen but both riders have performed at their best when supporting Mark Cavendish – and this alliance with the enemy would not serve an all-Australian team so well. What about Michael Matthews? Well, he has no Tour pedigree. ‘Bling’ may have recorded wins in both the Giro and Vuelta, but the 24-year-old is yet to race in the Tour. Meanwhile, Heinrich Haussler’s solitary 2009 stage win is not enough to squeeze the German-born sprinter into the equation. Right, on to my all-rounder – and who else but the rider described by The Age (back in 1958, mind) as “the best all-rounder Australia has seen”. Known as ‘Little Lord Fauntleroy’ because of his posh upperclass accent, Russell Mockridge was so fast when he broke onto the scene that he soon earned the kinder nickname of ‘The Geelong Flyer’. A track Olympic gold medallist and a three-time Australian national road race champion, Mockridge had only ridden one Tour before he was tragically killed in a collision with a bus in 1958, aged 30. Widely respected by his peers, Mockridge was one of only 60 riders to complete his only Tour in 1955 and did so without any teammates to draw on. His inclusion is perhaps a bit sentimental, but I’m picking a team of the century, not of the past decade. And finally, the position of team captain goes to Simon Gerrans. A veteran of nine Tours, Gerro may have one individual win and one team time trial victory to his name, but above all he brings to the table experience, level-headedness, the ability to perform over all terrains, and much character. 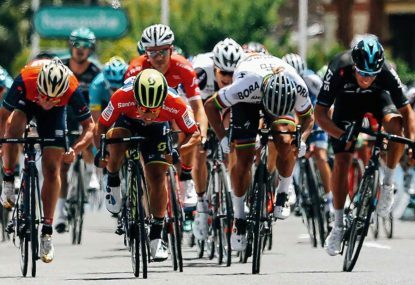 Gerrans commands respect and is a popular figure – and as team captain he’ll also have a free role to target stage wins when the others are laying low and keeping out of trouble. I hesitated a lot here between Gerrans and Hansen, for the latter certainly has the qualities to lead his men into war. But Gerrans just gets the nod for his explosiveness and deeper Tour experience. Cadel Evans, Phil Anderson, Mick Rogers, Don Kirkham, Robbie McEwen, Baden Cooke, Bradley McGee, Russel Mockridge, Simon Gerrans.